Evo Exhibits has been honored to be the recipient of numerous trade show booth design awards throughout its history, as well as awards celebrating Evo’s growth as a business. On November 1, 2016, the City of West Chicago announced the winners of the 2016 Brilliance in Business Awards. Evo Exhibits represents the “best in class” for the award category, Outstanding Growth. 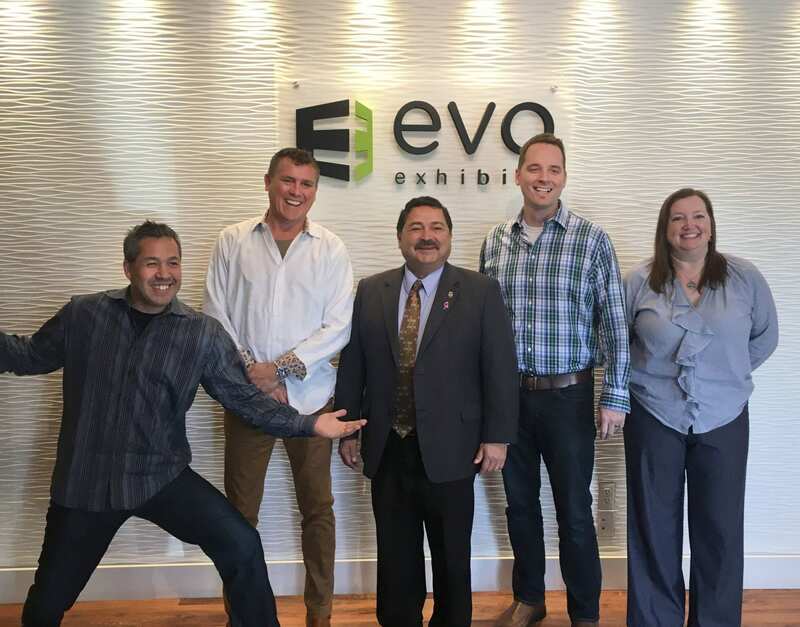 Award recipients will be recognized at the City of West Chicago’s City Council meeting on Monday, December 5, 2016, at 7:00 p.m.
On November 16th, the Evo Exhibits team enjoyed a site visit and meet-n-greet with Mayor Ruben Pineda. The Mayor, pictured here in the center, and his staff toured the 50,000 square foot facility to gain a broader understanding of the work and the industry that Evo serves. Kent Jean, CEO, Michael McCord, President, Brian Fujii, CFO, and Monica LaBrot, Marketing Manager, showed them around the facility. They discussed Evo’s diversification of event industry services and plans for continued growth. According to West Chicago Business Development Coordinator, Luis Martinez, judges were in unanimous agreement based on the compelling evidence presented to award the nominated businesses in the Outstanding Growth category. Evo Exhibits, located at 399 Wegner Drive, was founded in 2009 and has since been on a trajectory of noteworthy growth. It began with an idea – selling tailored displays to trade show exhibitors and special event coordinators looking for products and services to help promote and differentiate their business or special events. By 2011, the company added graphic design services, as well as introduced rental exhibits, prompting a need to add warehouse space. True to its name, Evo continued its evolution to accommodate its customers’ growing needs, and by 2013 moved to a 50,000 square foot facility with an on-site fabrication shop and loading docks in West Chicago. Along the way, Evo Exhibits has received trade show booth design awards and nominations for their expert work and dedication to quality.Today, its creative products range from portable displays to showroom environments, to full custom exhibits with a large rental inventory. Evo services its clients worldwide with show labor, shipping, furniture/carpet and A/V rentals replete with program management, exhibit storage, and asset management. “As one can imagine growth in any industry is a challenge but Evo Exhibits has progressively expanded internal operations to accommodate for client needs, increased its professional workforce, and continues to contribute meaningfully to West Chicago”, said Luis Martinez, City of West Chicago’s Business Development Coordinator. Get in touch today to partner with Evo Exhibits!